Introducing DAA's Digital Analytics Cookbook! The Digital Analytics Association (DAA) is officially kicking off a new initiative that we are calling the Digital Analytics Cookbook! The following provides some background information on this new initiative and how you can participate. The digital analytics industry is an exciting one and one that moves at a record pace. It seems like there are always new ideas, technologies and approaches to conducting digital analysis and very few of us actually went to college to learn what we do. As a result, many of us come at digital analytics from different angles and perspectives. However, as shown through books and blog posts, as an industry, great things are happening out there. Unfortunately, our industry has not had a great way to share what we actually do - performing digital analyses. In order to help with this, the DAA is asking its members to share their favorite digital analyses so that, as a community, we can create a collection of step-by-step directions on how to "do digital analysis." Just as a collection of great chefs might contribute their favorite recipes to a cookbook, we are calling upon our DAA community to help us build a cookbook of digital analysis recipes. A recipe is simply a description of a digital analysis that you have done in the past that has helped your organization in some way. There is no need to share your company's data. Just share the steps you took to conduct the digital analysis. An example of a recipe can be found here. If each of our DAA members can contribute a few recipes to the Digital Analytics Cookbook, as an industry, we will collectively have hundreds of examples of types of analyses that can be done at our organizations! These recipes will save us time and effort. They can also help us think about new ways we can use digital analytics to help our employers and grow our careers. In addition, the recipes are set up as a wiki so that fellow members can provide comments and feedback on the submitted recipes. Over time, our hope is that this commentary can help polish these recipes into best practices for our industry to follow. Growing the core body of knowledge for digital analytics will be to everyone’s benefit. Digital Analytics recipes will impact DAA in a variety of ways. They will be housed as an online body of knowledge and popular recipes could be highlighted in an e-book, in online webinars, and at DAA symposia. DAA is also exploring the creation of a new award to recognize recipe contributors at future DAA Award Galas. To contribute your recipes to the community, simply copy the body of the recipe here and paste it in the body of the recipe here. 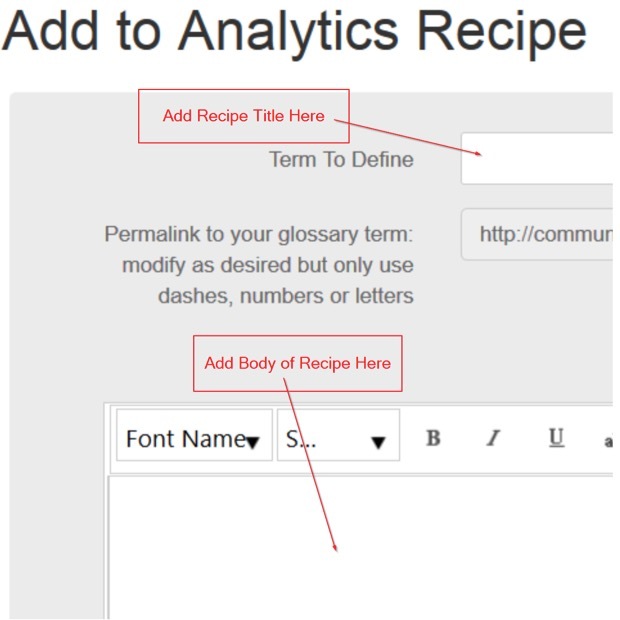 Enter your recipe title in the field “term to define” and at the bottom of the page, choose the stage of the recipe – ready, needs a little detail, needs a lot of help, etc. Then click save. Want to watch how to do this in a quick video? Go here. As you can tell, we are excited about this new initiative and hope that you will add your favorite recipes and help our community. If you have any questions, please reach out to Catherine Hackney at chackney@digitalanalyticsassociation.org.